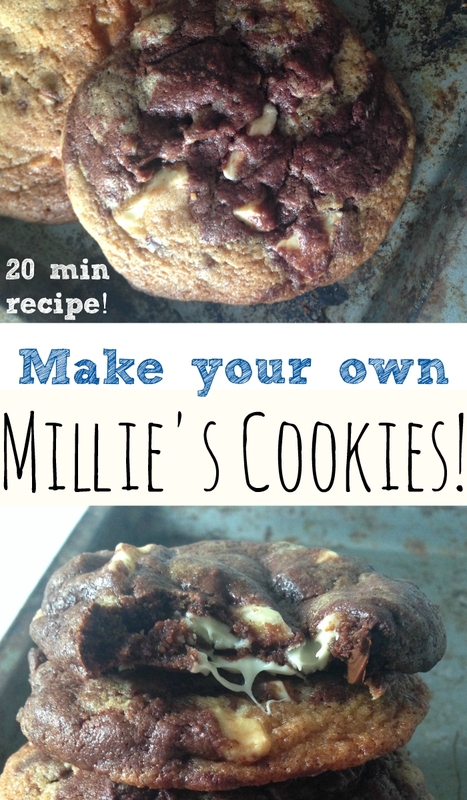 Make your own Millie’s Cookies at home! Soft chewy centres, crunchy edges and packed FULL of gorgeous melty chocolate! When I was a student, I might have had a little bit of a Millie’s Cookies addiction… they’re just so delicious and chewy and delicious again and SOO chocolatey! Occasionally, the store near my uni halls even gave away FREE SAMPLES which just made my life. Sadly I don’t live close to one anymore, and you know my conviction that homemade is (almost) always better – so presenting – homemade Millie’s Cookies! You will LOVE this homemade version of a Millie’s Cookie, because they’re soft, chewy and packed full of delicious brown sugar and chocolate flavour. Even better, they’re super easy to make and throw together in just a few minutes, and you can use whatever your favourite type of chocolate/whatever you have on hand to stuff inside them. I used Cadbury Whole Nut (chocolate with hazlenuts) which was delicious – you could also use regular chocolate chunks, or these Easy Millie’s Cookies Style Chocolate Chunk Cookies would also be fab with pieces of mars bars, or peanut butter cups! I also adapted the original recipe to cut down on the amount of sugar – but don’t worry, these cookies are still plenty sweet – just not to sweet. You could also adapt these cookies to be gluten-free by simply replacing the flour with gluten-free flour, but one thing is a must – use big chocolate chunks for a tasty and authentic Millie’s style cookie. Pretty cookie tip – as well as incorporating chocolate chunks into the batter, hold a few back to press into the cookie dough on the baking sheet before it goes into the oven – this will give you the pretty chunks on top! First, preheat your oven to 170C/gas mark 3/350F and grease three large cookie trays. Weigh out your flour, and whisk together in a large bowl with the salt and bicarbonate of soda. Set aside. In a smaller bowl, melt the butter in the microwave until completely liquid, and then remove and stir in the sugars. Beat until well blended and resembling a toffee mixture. Beat in the two eggs and vanilla into the butter sugar mix, and then pour everything into the larger bowl with the flour. Mix until just blended, then add your chocolate chips/chunks and incorporate with a wooden spoon. You can also leave the chips out for vanilla cookies, or add the extras of your choice. Using a tablespoon, dollop heaped tablespoons worth (about two if you want very large cookies, or one tablespoon full for smaller cookies). Leave plenty of room - at least three inches between cookies. Sprinkle a little sea salt onto each cookie and pop into the oven until very slightly browned, about 10-17 minutes depending on oven shelf. Take them out of the oven at this point although they might not look done, but they will firm up once they cool. What’s your favourite Millie’s Cookie flavour? I think mine has to be the classic – chocolate chip, but I’m terribly partial to the giant frosted cookies too! Mmm, frosted cookie! 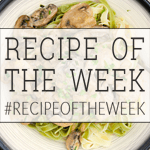 I’m entering my Millie’s Cookies into Recipe of The Week over at A Mummy Cooks. Just keep going until it’s browned slightly around the edge and not TOO squidgy in the middle – and leave to firm for an hour before cutting. These wonderful cookies look scrumptious and DELICIOUS !! Gasp, my husband is the same Lucy! My husband doesn’t usually eat cakes or biscuits, but he had three big cookies. Lovely recipe. Thank you. Made these today. The flavour is great but they turned out very cakey. More like sponge. What could I have done wrong? I’m sorry to hear that James! I’m not sure why they might come out cakey, other than perhaps a shorter cooking time or adding too much flour. I am going to remake them soon so I’ll ensure all my instructions are completely correct. Glad to hear they were still tasty though! Thanks for reading Kerry Cooks! 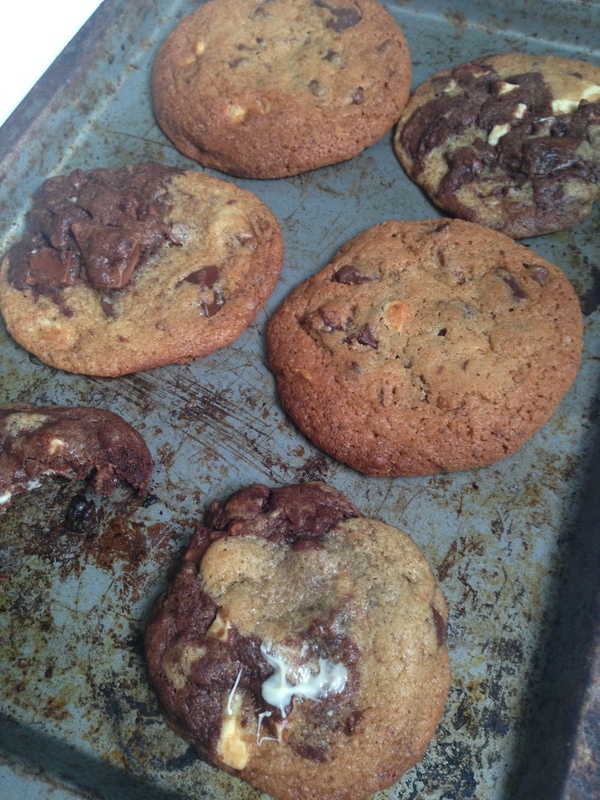 Hey Buddy!, I found this information for you: "Easy Millie’s Cookies Style Chocolate Chunk Cookies". 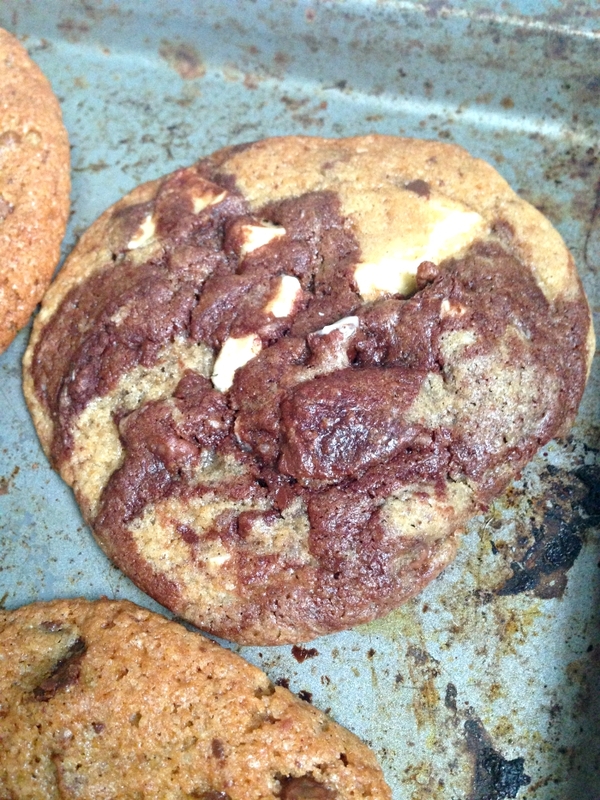 Here is the website link: https://kerrycooks.com/easy-millies-cookies-style-chocolate-chunk-cookies/. Thank you.